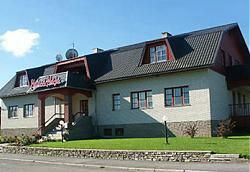 Heleni Maja Guesthouse was founded in 1995 and is one of the biggest facilities offering accommodation in Põltsamaa. There are 15 rooms with 32 beds in the guesthouse. Each room has a TV, a telephone and WiFi connection. Here you can enjoy your holiday or dedicate to your work. There is also a possibility to organise meetings and seminars for up to 20 people. A sauna with its cosy sitting room offers relaxation for about 12 people. For leisure time activity you can play billiards. A big parking lot is located in front of the guesthouse and is perfect for parking buses. Helen`s Guesthouse is about a ten minute walk from the city centre. At the edge of the town the biggest rose garden of Estonia with 800 different sorts of roses awaits you. Põltsamaa is also famous for its wines and you can taste different wines in the Põltsamaa castle wine cellar which is a favourite place for tourists.